Let’s talk about the dress what are you looking for? C. Something a little on the boho-chic side. D. Unique, maybe something in a bold color? A. A classy eye, with a rosy cheek, and a neutral lip. B. Polished and pretty, but keep it classy with a red lip. C. I like a light and airy look with a peach lip. D. Bold makeup to match my bold personality! To finish the look, hair! What will it look like? A. An up-do! I need to highlight my dress. B. Pinned up into a sleek ponytail. C. Loose, with natural waves. D. Something a little crazy and eccentric! What type of flowers will you be holding? A. Red roses, I mean what else says eternal love? D. Who says I’ll be using flowers? Where will your big day be? A. A church, which houses the many beginnings of love. C. Somewhere rustic yet modern. D. Somewhere fun for the guests! What will your playlist include? A. Sweet love songs to slow dance the night away. B. All the classics, like Frank Sinatra and Etta James. C. Acoustic covers of all the love songs. D. Definitely bringing in a live band! 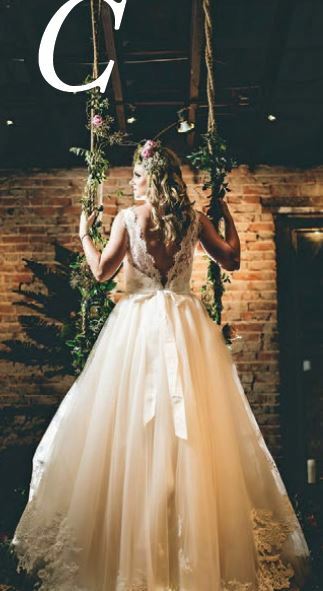 It’s your fairytale wedding dream come true! Your sweet and dreamy persona has been translated perfectly into your wedding day. From the ball gown to the venue, you’ve made sure that the biggest day of your life is as special as it can be. Don’t forget your glass slipper! You like to keep it simple and chic! Your love of a crisp and clean décor calls for a minimalist feel to your wedding day. Your guests will be dazzled by the sleek dress and the classic tunes. The flowers in your hair say it all- you’re the bohemian bride to be! Your inspiration comes from the earth, and a love for the simpler things. From the decorations, to the venue, you’ll be sure to keep everything local and effortless. Let the free-spirited, flower crowned bride-to-be shine through! Let’s be honest—you’ve never been one to do things by the book, right? So why let your wedding be any different! After all, there are many shades of love, and they are all unique. So let your rebel side out, throw that textbook out the window and take a walk on the wild side.